Kings of Pool version 1.17 brings two new brand game modes, including AR. The AR mode is exclusive to iOS 11 and works only with ARKit supported device. Just imagine being able to spawn a pool table everywhere you are and play. Players can scale the table to fir the area where they in. 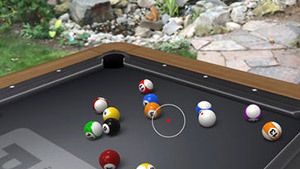 In update version 1.17, Uken Studios, the developer of Kings of Pool, introduce a new AR game mode. This mode is developed exclusively for iOS 11 ARKit supported devices. This mode allows you to play your favorite pool game everywhere you go by spawning a pool table right in front of you. Just find a nice flat surface, put the pool table and scale it up to your preferred size. I've played this game in the middle of the street and it was a really amazing experience. The lighting and shadows were done just right and it really seems like a real pool table is there in front of me, well, kind of. The graphics are nice, but not ultra-realistic, and it would nice to see more realistic tables so the experience will feel more authentic. The controls are simple but I think they might confuse a few players. You need to tap anywhere and drag to take a shot. I've read some comments from players complaining about unintuitive controls and guess the best option is just giving the players the option to choose which control scheme they prefer to use or let them customize it themselves. That aside, one of the cool think about this Ar mode for Kings of Pool is the ability to walk around the table like you do in real life, and position yourself before you take the shot. You don't need any other accessory nor a VR headset to play this game. All you need is your iPhone or iPad ARKit-compatible device and you are good to go. If you find yourself needing to take a break and play some pool without needing to go to the pool place, just launch the app and have fun. 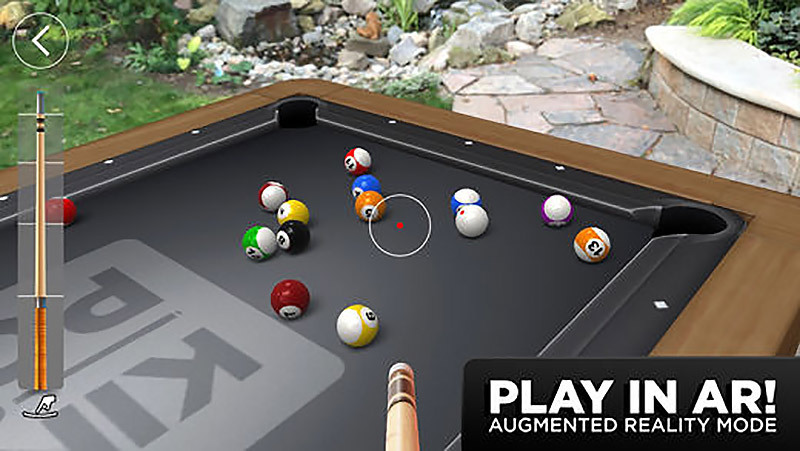 We've already seen some other sports games like Table Tennis getting their AR version and it's nice seeing pool getting its share among those great AR games. There is still a lot to be desired in this mode like playing against another real player, seeing his avatar where he or she is at, etc. I think once the base is laid down right and more people play with it and share their opinion about it, Uken Studios can focus on improving it with each new update. I recommend checking out this unique AR mode. You can share your opinion about this AR mode in our forum, have fun! I'm looking forward seeing what this new AR mode will eventually become to be. There is a great potential right there for an amazing AR social experience and I hope the developer sees that opportunity and be able to make it into a reality.